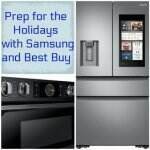 If you are building or renovating a home, or even just a kitchen, you should check out the Samsung Open House at Best Buy stores. Even if you’re only wanting to replace one large kitchen appliance, you can take advantage of this event. Want to upgrade your refrigerator? Check out the Samsung Black Stainless 4-Door Flex™. Now this would be an awesome refrigerator to have. The fridge and freezer areas both look pretty spacious to begin with. But get this–the bottom right segment can be either fridge or freezer, depending on what you’re needing at the time. And there are 4 different temperatures to choose from. I am also loving the organizing capacity. Those crisper drawers are amazing. I could definitely find things to put in all those drawers. And DH and I could stop fight for space for our stuff. The 4-Door Flex also has Power Cool and Power Freeze options, which can lower the temperature of either compartment in minutes, so you can chill your favorite drinks or firm up ice cream in no time! In the market for a new oven? Check out this beauty! This is the Samsung Flex Duo® Range and it can be two little ovens or one big one, depending on what you’re cooking! Have you ever tried making multiple dishes at once? It can be frustrating trying to juggle it all! Imagine being able to bake a green bean casserole, fresh bread and a sheet of cookies all at once! The Dual Door with Smart Divider opens either separately or as one door for versatile cooking options and the FlexDuo technology enables you to cook at 2 different temperatures at once. And don’t forget the stove top! The Samsung electric range, features 5 cooktop elements and a warming drawer. A warming center burner keeps sauces and side dishes hot until they’re ready to be served and the warming drawer offers 3 settings to accommodate different dishes. There are 3 different offers you can take advantage of at the Samsung Open House at Best Buy. Which Samsung appliance would you love to have? I love the refrigerator shown above. Samsung has some really awesome appliances. When it is time for me to purchase appliances, this is likely the brand I will be buying. That is the coolest fridge. Wonder if Santa would bring me one. Samsung makes the best appliances and I have one of their ranges and it has never burned my food. I really want their refrigerators when mine goes out!